The 3D structure of human ATP-citrate lyase, a metabolic enzyme that plays a key role in cancer cell proliferation and other processes. Columbia University scientists, in collaboration with researchers from Nimbus Therapeutics, have demystified a metabolic enzyme that could be the next major molecular target in cancer treatment. 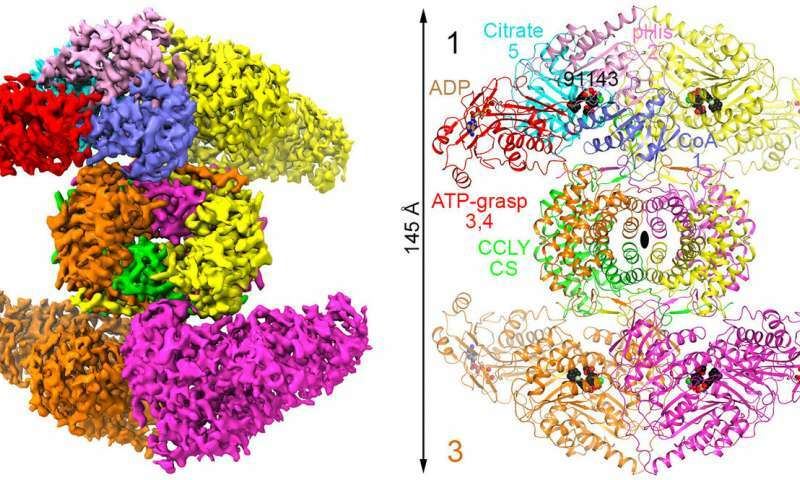 The team has successfully determined the 3-D structure of human ATP-citrate lyase (ACLY)—which plays a key role in cancer cell proliferation and other cellular processes—for the first time. The findings, published April 3 in Nature, represent a first step in better understanding the enzyme in order to create effective molecular targeted therapies for patients. While previous experiments have succeeded with fragments of the enzyme, the current work reveals the full structure of human ACLY at high resolution. "ACLY is a metabolic enzyme that controls many processes in the cell, including fatty acid synthesis in cancer cells. By inhibiting this enzyme, hopefully we can control cancer growth," said Liang Tong, William R. Kenan Jr. professor and department chair of Biological Sciences at Columbia and senior author of the study. "In addition, the enzyme has other roles, including cholesterol biosynthesis, so inhibitors against this enzyme could also be useful toward controlling cholesterol levels." Targeted therapy is an active area of cancer research that involves identifying specific molecules in cancer cells that help them grow, divide and spread. By targeting these changes or blocking their effects with therapeutic drugs, this type of treatment interferes with the progression of cancer cells. Earlier this year, another group of researchers presented results of a phase 3 clinical trial for bempedoic acid, an oral therapy for the treatment of patients with high cholesterol. The drug, a first-generation ACLY inhibitor, was shown to reduce low-density lipoprotein (LDL) cholesterol by 30 percent when taken alone and an additional 20 percent in combination with statins. ACLY has been found to be over-expressed in several types of cancers and experiments have found that "turning off" ACLY leads cancer cells to stop growing and dividing. Knowledge of the complex molecular architecture of ACLY will point to the best areas to focus on for inhibition, paving the way for targeted drug development. Tong and Jia Wei, an associate research scientist in his lab, performed an imaging technique known as cryogenic electron microscopy (cryo-EM) to resolve the complex structure of ACLY, using the facility at the New York Structural Biology Center. Cryo-EM allows for high-resolution imaging of frozen biological specimens with an electron microscope. A series of 2-dimensional images are then computationally reconstructed into accurate, detailed 3-D models of intricate biological structures like proteins, viruses, and cells. "A critical part of the drug discovery process is to understand how the compounds work at the molecular level," said Tong, whose lab specializes in the mechanism and function of biological molecules. "This means determining the structure of the compound bound to the target, which in this case is ACLY." The cryo-EM results revealed an unexpected mechanism for effective inhibition of ACLY. The team found that a significant change in the enzyme's structure is needed for the inhibitor to bind. This structural change then indirectly blocks a substrate from binding to ACLY, preventing enzyme activity from occurring as it should. This novel mechanism of ACLY inhibition could provide a better approach for developing drugs to treat cancer and metabolic disorders. "This paper is a terrific example of how our work at Nimbus combines cutting-edge technology, computational approaches, and deep drug discovery experience to generate new scientific insights," said Jeb Keiper, chief executive officer at Nimbus. "We're excited to continue collaborating with experts as we interrogate new targets and deepen our pipeline of therapies."